A £1m repair bill for Belfast apartments, a sectarian attack, and the jailing of a former solicitor for domestic abuse make the headlines on Friday. The Belfast Telegraph leads with the story of the Belfast city centre apartments that have been evacuated for safety reasons. The paper says that the 91 homeowners were previously asked to pay £10,000 each towards the repair bill. It says the bill could ultimately be covered by insurance. However, that could not be confirmed, it adds. The repair works at the upmarket development - above the Victoria Square shopping complex - are expected to take five months to complete, according to the paper. It adds that some of the apartments were recently advertised for sale at £195,000 and £215,000. 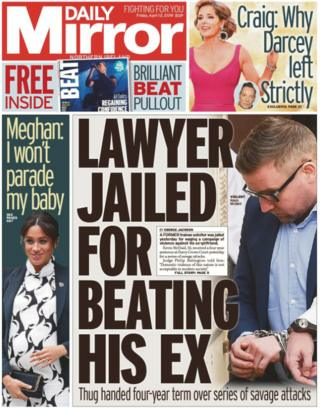 The Daily Mirror leads with the jailing of a former trainee solicitor for what it calls "a campaign of violence" against his former girlfriend. The other charge was against a neighbour, who was attacked after he intervened when he saw McDaid dragging the woman by the hair along a Londonderry street. Among the weapons McDaid used to attack his girlfriend was a wooden bedside locker. He was jailed for four years. Violence also features on the front of the Irish News. The papers says a house on Newtownabbey's mainly Protestant Rathcoole estate was "completely ransacked" in a sectarian attack on Wednesday night. Four masked men were involved in the attack. The Irish News says that the house that was attacked is believed to be among new homes built in the estate in recent years. The News Letter returns to the issue of strike action by electricity workers in Northern Ireland. Members of the Prospect trade union who operate the electricity transmission system in Northern Ireland had announced a 24-hour strike for Monday 15 April. However, the paper says that due to a revised pay offer that action has been suspended. The union says the strike action has been paused but adds that it will be recommending its members accept the pay offer. Thefts from cash machines have, of course, been very much in the news in Northern Ireland recently. The News Letter also reports on a court case over a different type of cash machine theft to the spate of digger-led robberies that have made the headlines recently. Belfast man Jamie Scott Leitch, of Ardkeen Crescent, took advantage of a Danske Bank technical fault to steal £10,700 in September 2017. The fault meant that customers could withdraw money without it coming out of their accounts. Leitch used a card belonging to a relative of his wife 54 times over a two-hour period. He was sentenced to 200 hours of community service. The Belfast Telegraph talks to a survivor of the Bergen-Belsen concentration camp who delivered a talk at the Ulster Museum on Thursday night. As a child, Tomi Reichental played hide and seek amid the bodies at the notorious Nazi camp. Thirty-five of his relatives were among the millions murdered in the Holocaust. He says the response from young people he has talked to has been amazing. "There is a real difference between hearing this from a teacher and hearing it from me," he says. "I was there. After all the horror, I am doing my best to keep the memory of those lost ones alive." The Irish News comment pages feature a scathing attack on Northern Ireland Secretary Karen Bradley by Alex Kane. He says that Ms Bradley should not be allowed to have anything more to do with the next round of political talks at Stormont. Ms Bradley is the cabinet equivalent "of the poor sod who is always the last person to be picked for a team and only picked because the regulations require it", he adds. And he claims that his cat "who spends a great deal of time watching news programmes with me - although he also dozes off, or just licks his bottom - has a greater grasp of the realities and nuances of local politics than does Karen Bradley". What Northern Ireland needs is a "big hitter", says Mr Kane, someone "with the clout to bang heads together".